Some of CT’s best restaurants are open on Thanksgiving Day and serving special meals. Click here for a full guide! Ambler Farm’s Farm Stand is officially closed for the season, but they are reopening for two days leading up to Thanksgiving. Visit them on Monday 11/19 from 3-6pm and Tuesday 11/20 from 9am-Noon to pick up farm fresh goodies for your feast. On Sunday November 25, The Best Connecticut Food Show returns to New Haven. Local chefs will gather in the LoRicco Tower BallRoom while guests taste and sample. 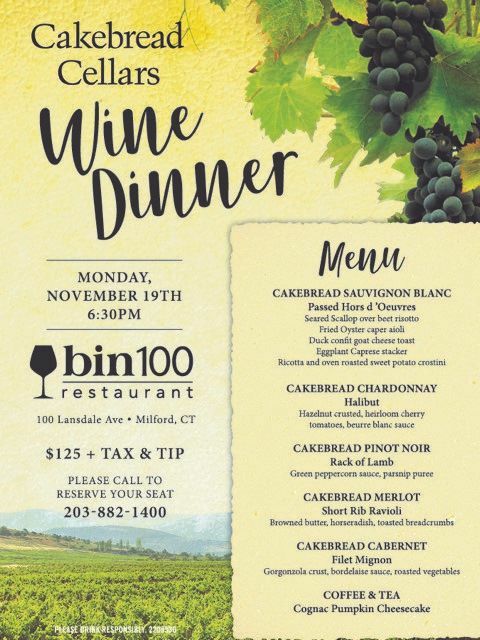 On Monday November 19, Bin 100 in Milford invites you to a Cakebread Cellars Wine Tasting Dinner. In addition to wine pairings, they’ll serve Passed Hors d ’Oeuvres, Halibut, Rack of Lamb, Short Rib Ravioli, Filet Mignon, and Cognac Pumpkin Cheesecake. It is $125 per person, plus tax and tip. Tim’s Kitchen and Wakeman Town Farm will have a Thanksgiving-Themed Class for Elementary-aged kids on Monday November 19. Participants will make fun Acorn Cookies, Pilgrim Hat Cookies, and Krispie Pumpkins. With the holidays approaching, Basso Café has started selling some of their signature goods. You can now purchase their Tomato Sauce, Herb Infused Extra Virgin Olive Oil, Lemon Soy Salad Dressing, Vanilla Biscotti, and Basso Sangiovese Toscano as a gift basket. Need food for Thanksgiving? Westport Farmers’ Market has you covered. The Thanksgiving holiday market is on Tuesday December 20th from 10:00 - 2:00 at Gilbertie’s Farm in Westport. . Shell & Bones Tuesday Night Dinner Series has returned for a fourth season! Join them on Tuesday nights for a 3 course prix fixe menu for $38 per person (or $50 per person with wine pairings.) The menu changes weekly and reservations are recommended. ONTHEMARC’s first cookbook, “Beginnings,” goes on sale November 20th. “Beginnings,” is a cookbook with short stories about firsts: first bites, first sips, and the beginnings of OTM Catered Events as we know it. Replete with gorgeous food photography and well-appointed recipes, this cookbook is designed with the ambitious chef in mind. Half Full Brewery and Lock City have teamed up to make “Welcome to Fabulous Stam Vegas,” a Sour IPA that's brewed with lactose and generously dry-hopped. They’ll releasing it on November 21st at Half Full and Hapa food truck will cook up a special menu as well! Get the Thanksgiving celebrations started a day early with Cantiki’s Thanksgiving Eve Bash on Wednesday 11/21. $40 gets you a 3 hour open bar and $55 includes unlimited tacos. Tickets are available for purchase online. Bull & Swine in New Haven is also hosting a Thanksgiving Eve party. Join them for “Thanksgiving Rockin’ Eve” starting at 8pm. With the price of admission you will receive OPEN BAR and complimentary passed snacks until close. The Bridgeport Sound Tigers will be hosting a craft beer tasting event on Friday 11/23/18 prior to their 7pm game versus the Hartford Wolf Pack. Visit their website to check out the special package. The 6th Annual Kent Holiday Champagne Stroll will take place on Friday November 23 and Saturday November 24 from 4-7:30pm. More than 25 Shops will serve champagnes and sparkling wines and special promotions and appetizers will be offered town-wide. Tickets start at $22. Bartaco has launched several new menu items in honor of fall and winter. New offerings include beet + goat cheese, pork posole, beet + kale + goat, a miso cod #bartacosecret taco, black beans with sofrito, and horchata caramel panna cotta. Bloodroot’s 2019 Calendar is now available! Purchase it online for $18.00 plus $3.75 for shipping in the U.S. For International Shipping, please call Bloodroot at 203-576-9168. Kimberly (@mightBvegan) is an Atlanta-based chef, storyteller, and founder of Might Be Vegan—a plant-based culinary group dedicated to helping people eat more plants. From Monday November 19-Sunday November 25, she’ll present a VIRTUAL “7-Day Jumpstart to Vegan Challenge” in Hartford, CT.